Active investors make numerous decisions about their portfolio annually, and some alter their portfolio weekly. With each of those decisions, dozens of factors play a role influencing which direction the investor takes and which products he or she buys or sells. Spectrem’s new study Portfolio Decision Making examines which factors play the greatest role in aiming those decisions in the direction they take. There is no question about the validity of the first choice for most investors in determining what individual stocks or bundled products to invest in. 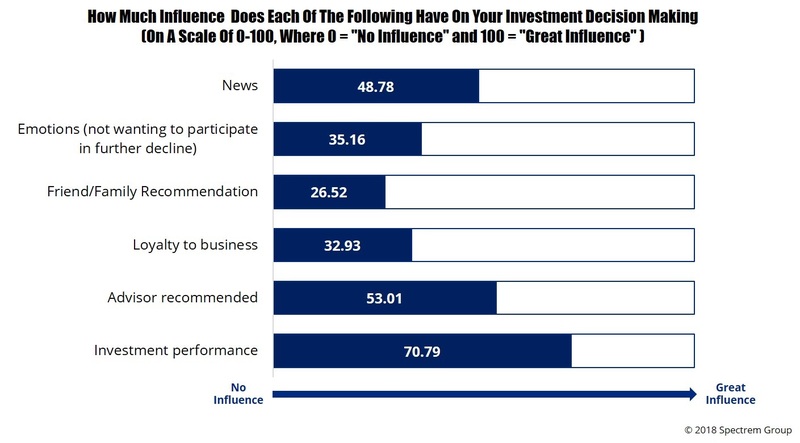 Asked to place decision-making influence on a 0-to-100 scale, “investment performance” got the highest rating at 70.79, a notably high rating as an average response. Advisors can start with the investment performance in conversations with investors, noting the factors which determine why an individual product is performing as well as it is. If a poor investment performance is leading an investor to drop a product, advisors can share their knowledge about whether current performance is likely to be maintained. The knowledge advisors have actually ranked second among investor influences at 53.01, although the midpoint status indicates that investors weigh their advisor recommendations against other influences. For example, news reports about market conditions and product performance ranked third among investors with a rating of 48.78, nearly the same as the influence of advisors. On a personal level, financial advisors run second again to spouses in terms of the influence on investors who are pondering a change to their investments. Again, on the 0-to-100 scale, a spouse rated at 59.14 to the advisor’s 55.56 rating, which are similar ratings but also show that it is not one person in an investor’s life who determines their investment decisions. On a product-by-product basis, the performance of the investment, the future potential of the investment, diversification and familiarity with a product are the four top influences that drive investor decision-making. This is another area where advisors can assist investors with an understanding of where the investment performance stands currently, how that compares to previous performance and what factors weigh upon the future performance of that product.